Ocean City has been victorious in the each of the last two season openers and after last Wednesday's 3-0 win over AFC Ann Arbor in the First Round of the Lamar Hunt US Open Cup, the Nor'easters are hoping to get the 2018 season off on the right foot under second year head coach John Thompson. "We are looking to take the momentum from Wednesday night's US Open Cup win into the FA Euro game this weekend," said Thompson. "With the Open Cup travel, training time has been limited to one full speed training session yesterday, a light session Saturday, then recovery Monday and then we travel from Tuesday to Thursday [for the US Open Cup game in North Carolina]. We will have had less preparation and time together on the pitch then we would have liked, but that's the craziness of PDL and the Open Cup, the lads have been brilliant from day one and we have a squad full of experienced players who know how to win." Alex Smir made seven saves to earn the shutout for Ocean City in the club's midweek Open Cup win, while Williams N'Dah, Simone Raioli and Fredinho Mompremier tallied the goals. Deri Corfe assisted twice as part of a strong all-around effort in his Ocean City debut. The Nor'easters have won every game they have played against FA Euro, leading the all-time series, which dates back to the 2013 season, 6-0-0. That doesn't mean it hasn't been a competitive rivalry over the last few years. The last four games between the two clubs since 2014 have all been decided by a single goal, including Ocean City's sweep from last year which were both 1-0 games. Both wins during the 2017 season were tremendous defensive efforts with Ocean City scoring an early goal and the defense keeping a clean sheet the rest of the way. 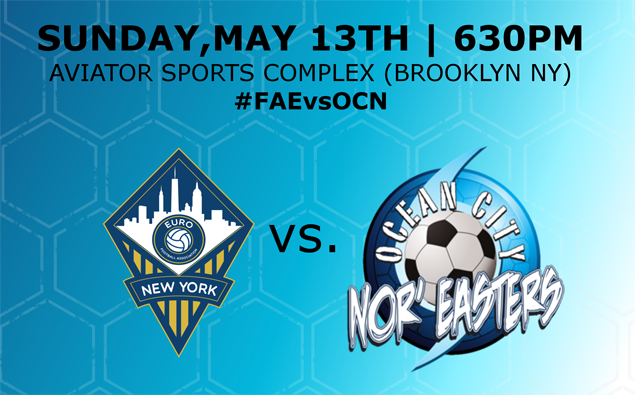 On May 25 in New York, Francisco Neto scored a 34th minute goal and Jimmy Slayton had a shutout in goal for the Nor'easters. In the return leg at the Beach House on June 25, it was Max Hemming who scored a 4th minute goal and Todd Morton earned the clean sheet in between the sticks. "FA Euro gave us two good games last season," said Thompson. "We won both by a single goal but they created plenty of chances and are a dangerous team if any of the lads consider taking them lightly they will be in for a shock. They are very technical will have plenty of possession in the game, we have to be prepared to take our chances when we get them." This game is the first of four straight road games -- five if you include this Wednesday's US Open Cup game -- to start the 2018 season. After Sunday's game, the Nor'easters head south to Matthews, NC to take on the Charlotte Independence, a pro team from the United Soccer League, in the Second Round of the US Open Cup. Only two amateur teams in the country have more pro team upsets than the Nor'easters (5) and no amateur teams have more shutouts against professional opposition (6). The Storm are hoping to add to their impressive Open Cup resume on Wednesday. Ocean City's home opener in league play isn't until June 3 when they host the Long Island Rough Riders at Carey Stadium.